Brighten up yellow nails with Ecrinal, Revlon and Quo by Orly! 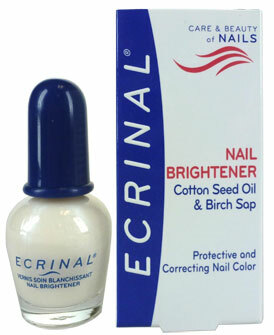 Ecrinal Nail Brightener - $16.95 - with a paraben, formaldehyde, acetone and toluene free formula that contains bamboo stem extract to provide a durable and protective shield while fine pearlescent particles highlight the nail surface and give an iridescent, smoothing and luminous glow for nails that are bright, white and healthy looking with a flawless, impeccable finish. Revlon Nail Brightener - $6.50 - instantly brightens nails with a unique new formula that contains a mineral diamond treatment that increases luminosity and restores the nails natural brightness and evens out nail surface for a smooth finish and bright, youthful looking nails. Available at drugstores and mass market retailers across Canada.